In an exclusive interview with RBTH, Arif Havas Oegroseno, Deputy Minister of the Coordinating Ministry of Maritime Affairs of Indonesia talks about the security challenges in the Asia-Pacific and Russia’s role as a maritime power in the region. RBTH: What do you consider are the main traditional and non-traditional threats to the maritime security of the Asia-Pacific region? A.H. Oegroseno: The main traditional threat in my opinion is the sovereignty disputes, which we still see in the region. Unfortunately these disputes are not always managed with discussions. There are of course, on-going discussions, workshops, seminars and conferences, but the ground reality suggests a different story. The most important non-traditional threats are two-fold in general. They are manmade and non-manmade. The manmade threats include drug smuggling, human trafficking, human smuggling and illegal fishing. There was a problem of arms smuggling in places like the southern part of the Philippines and northern part of Sulawesi. There was a conflict in Mindanao. These problems were effectively taken care of. The non-manmade security threat is nature. The warming of the ocean, which is actually manmade. The rising of sea levels, the acidification of the oceans and the changing of weather patterns…these are all challenges that we face today. Some of these challenges cannot be handled alone. Some of them need to be handled by cooperation between countries, international organizations and many different stakeholders. RBTH: Given the tensions over maritime boundary disputes in the region, what do you think is the right approach towards a solution? A.H. Oegroseno: Countries need to look at these issues very carefully, thoughtfully and comprehensively. Naval officers need to establish a mechanism where they agree to not create unnecessary complications. We need to instill the culture of international law, where if we have a conflict we discuss that in a civil manner. Take the matter to court. If you cannot bring the matter to court then let’s try arbitration. If that doesn’t work it’s okay. Countries have sovereignty disputes for hundreds of years, as in Gibraltar. But (England and Spain) still managed to create an atmosphere of trust. Discussions are the best way to deal with disputes. We are obliged under the UN charter and the UN Convention on the Law of the Sea, the Treaty of Amity and Cooperation in Southeast Asia to address issues peacefully. We need to implement these treaties and not to lose track of the greater stakes. At the end of the day, the question is very clear. Do we want chaos or do we want peace? This is not a time for us to have something similar to the Cold War. In the Cold War, everything was classified as black and white, where conflict was met with military deployment. During the Cold War, nobody would have imagined that somebody would put a bomb on his body and go to the market and blow himself up. It happens today and this is not a threat that one single country can handle. The strategic environment has changed completely and countries cannot have a black and white assessment. We have cyber crimes. During the Cold War, computers hardly existed. The new developments create a situation where everybody needs a partnership. We need more partnerships to solve maritime disputes and bring about peace. RBTH: How does Indonesia feel about the increasing number of air and naval bases in the Asia-Pacific, such as Cam Ranh Bay, which is used by Russian aircraft? A.H. Oegroseno: We have to look at the larger picture. I think military bases are reflections of treaty obligations. The U.S. is in Asia because of its treaties with a number of countries. We also have to look at our region in terms of our existing infrastructure. ASEAN plays an important role in mediating different interests. The most important element in security is the creation of regional architecture that stabilizes conflict-like situations. 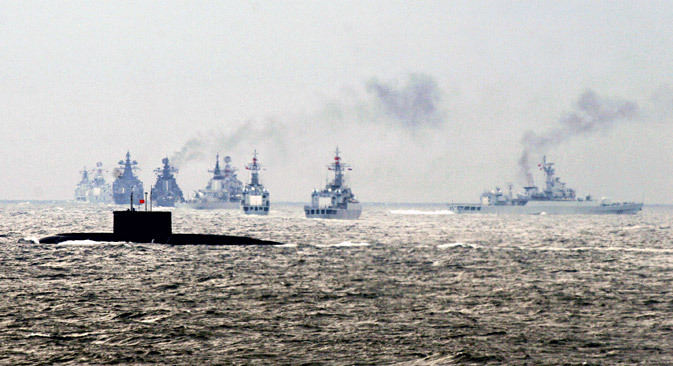 RBTH: What role do you see Russia playing in the maritime security environment of the Asia-Pacific? A.H. Oegroseno: Russia has an important role in the Asia-Pacific. Russia is part of the East Asia Summit. In the context of the East Asia Summit, we discuss maritime security. As a matter of fact, I just attended the ASEAN Extended Maritime Forum, where I met my colleague from Russia and we discussed various issues related to maritime security in our neighborhood. Russia’s contribution in this area is highly expected. I believe this scenario is here to stay. Russia is an important part of Asian security mechanisms. RBTH: Do you think Russia can act as a mediator between China and Southeast Asian countries who dispute islands on the South China Sea? A.H. Oegroseno: I don’t think any particular country can be a mediator in the conflict itself. If we look at the jurisprudence of the sovereignty conflict, the only arbitrators are the International Court of Justice and international tribunals. The sad fact about the maritime dispute in the South China Sea is that in all other disputes, there are only two countries, but here we have six (laughs). So it’s going to be very difficult for Russia to mediate. Even Indonesia, we are not a claimant party, but we never dreamt of becoming a mediator in the South China Sea conflict. Indonesia, Russia and other countries can play a role in the management of the conflict. I’d like to add some context for your readers to understand the conflict. The fact of the matter is that none of the claimant states have made a very clear claim. China says ‘we own the South China Sea.’ The Vietnamese government claims to own all the Paracel and Spratley Islands. The Philippines claims the Spratly Islands. Brunei and Malaysia claim islands on the basis of contiguity. In international courts, none of the countries have a very strong, solid, legal claim. Indonesia’s view on this specific matter has always been clear. Our humble request is that all claimants in the South China Sea clarify their claims, mention how many islands they claim, the names, the coordinates and the legal basis of claims. RBTH: Recently there have been reports about Indonesia expressing interest in buying Russian Kilo-class submarines. Are we likely to see an agreement in the near future? A.H. Oegroseno: This really is not my domain, but as far as I know, discussions are going on in the parliament on the budget and defense expenditure planning. The Ministry of Defense looks after procurements. But, I think the fundamental policy of Indonesia is to increase our domestic production capacity in defense. We have been able to manufacture rifles and we export them. We manage to produce 6 million bullets per year, for our own use and for exports. We are self-reliant here. Our shipyard is now building a naval hospital for the Philippines. We’ve also managed to build our own helicopter. In terms of international cooperation, we are open to countries with good technology, like Russia. We’re also looking at other countries like (South) Korea. We built a submarine with Korea. We’re going to build a stealth frigate, with Korean assistance in 2017. RBTH: Russia and Indonesia face a common threat from ISIS. Are the countries looking to cooperate in a coalition against the group? A.H. Oegroseno: We have worked with Russia to counter radicalization. ISIS has a very active global networking cell. We need to have a global understanding because their recruits come from everywhere. The number of Indonesians going to Syria to join ISIS is not as much as those from Europe. There are around 300 people from Indonesia. We are looking at different angles, especially intelligence cooperation with our partners. RBTH: Are there any plans for a common maritime security framework among countries in the Asia-Pacific? A.H. Oegroseno: Not in the style of OSCE or NATO, but we do have the ASEAN Defense Ministers Plus, with Russia, India, China and the U.S. The infrastructure will come from there.